A former England schools' international, Greenwich-born Nicky Law came through the ranks at Arsenal before making his league debut wirh Barnsley. Spells at Blackpool, Plymouth, Notts County and Rotherham forged his reputation as a determined and efficient defender. Nicky joined the Spireites in the deal that took Tony Brien to Millmoor in October 1993.He was already familiar to the fans as Rotherham's emergency goalkeeper in at Saltergate when Billy Mercer was carried off injured in the `93-4 season - he kept a clean sheet that day.His coolness and commanding presence had an immediate, settling effect on those around him: as skipper to the '94-5 play-off winning side, his ability to read the game, to encourage and, occasionally, bully his team-mates was a key factor in the side's success.Indeed, John Duncan rated him as the finest captain he had worked with - some compliment, from the man who brought Steve Baines to the club. His powerful long throw gave the side attacking options: normally reliable at spot-kicks, he also weighed in with some important goals from open play, none more so than the one in the second leg of the play-off semi that set the Spireites on their way to victory over local rivals Mansfield. In the Second Division, age and injury reduced his effectiveness, and he was eventually freed to Hereford. Injury continued to hamper him there and, unable to settle in, he was freed to Ilkeston, where he played and coached. In the summer of '98, he returned to Saltergate to succeed George Foster as the club's Community Officer. 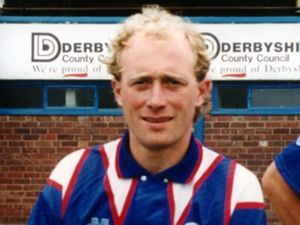 Some Chesterfield fans nicknamed him "Herman the German", as much for his Beckenbauer-like efficiency on the field as his blond, Teutonic looks. When John Duncan left the club in April 2000 Law was chosen to be the new manager and took Chesterfield to promotion at the first attempt, although the wider football world will always regard the achievement as tainted by Darren Brown's shameful, criminal activity. Allegations of involvement in illegal "brown envelope" payments to players were unproven, but the mud stuck. Faced with post-Brown austerity the task of keeping Chesterfield in League One would prove to be nightmarish, but Law just about kept the side above the drop zone. He had begun to rebuild, recruiting Glynn Hurst from Stockport, Allott and Innes from Oldham and giving a second chance of a football career to Jamie Burt, but when Bradford offered him their manager's seat, and he left for Valley Parade at the end of December 2001. At Bradford he found another club bogged down by a dreadful financial position and could not bring success, being sacked in November 2003. He moved on to Grimsby but was relegated with them on the day that Glynn Hurst's goal against Luton kept Chesterfield up. Six months out of the game ended with his appointment as Buxton's manager and, under him, the Peakites saw some of their old glory days return, with successive promotions. This success alerted Conference North side Alfreton Town, and Nicky was appointed Manager there in May 2006. With the support of chairman Wayne Bradley, Law guided The Reds to promotion to the Conference National in 2011 and, in perhaps an even greater achievement, kept them there. Nicky's son Nicholas was once a Chesterfield Academy player but went into the pro game with Sheffield United, while another son, Josh, was invited to step up to the professional ranks with Chesterfield in 2006 before following his father to Alfreton Town.